BEIJING, June 23 (Xinhua) -- Chinese President Xi Jinping has called for efforts to break new ground in major country diplomacy with Chinese characteristics, with the guidance of the thought on diplomacy of socialism with Chinese characteristics for a new era. In an address at the Central Conference on Work Relating to Foreign Affairs held in Beijing on Friday and Saturday, Xi, who is also general secretary of the Central Committee of the Communist Party of China (CPC) and chairman of the Central Military Commission, underscored the importance of keeping in mind both internal and international imperatives, focusing on realizing Chinese nation's rejuvenation and promoting human progress, and making contributions to the building of a community with a shared future for humanity. He also urged the efforts to firmly safeguard China's sovereignty, security and development interests, take an active part in leading the reform of the global governance system, and build a more complete network of global partnerships, so that new advances will be made in major country diplomacy with Chinese characteristics to create a favorable environment for, and make due contributions to, building a moderately prosperous society and a great modern socialist country in all aspects. The conference was presided over by Li Keqiang, member of the Standing Committee of the Political Bureau of the CPC Central Committee and Premier of the State Council. Attending the conference were: Li Zhanshu, member of the Standing Committee of the Political Bureau of the CPC Central Committee and Chairman of the Standing Committee of the National People's Congress; Wang Yang, member of the Standing Committee of the Political Bureau of the CPC Central Committee and Chairman of the National Committee of the Chinese People's Political Consultative Conference; Wang Huning, member of the Standing Committee of the Political Bureau and member of the Secretariat of the CPC Central Committee; Zhao Leji, member of the Standing Committee of the Political Bureau and Secretary of the Central Commission for Discipline Inspection of the CPC Central Committee; Han Zheng, member of the Standing Committee of the Political Bureau of the CPC Central Committee and Vice Premier of the State Council; and Vice President Wang Qishan. Xi said since the 18th CPC National Congress in 2012, facing with the vicissitudes of the international situation, China has overcome difficulties to push forward major country diplomacy with Chinese characteristics in a groundbreaking way under the strong leadership of the CPC Central Committee, having withstood various challenges, cracked hard nuts and made achievements of historic significance. Through these practices, China has accumulated useful experience and came to the conclusion that conducting external work requires taking into account both domestic and international situations, maintaining strategic confidence and resolve, putting forward innovations in diplomatic theory and practice, promoting strategic planning, advancing diplomatic agenda globally, safeguarding China's core and major interests, upholding win-win cooperation and justice while pursuing shared interests, and thinking about worst-case scenarios and risks. "We have kept a firm hold of the development trend of China and the world in the new era since the 18th CPC National Congress and made a series of important innovations on external work in theories and practices, thus forming the thought on diplomacy of socialism with Chinese characteristics for a new era," said Xi. - Nurture a distinctive style of Chinese diplomacy by combining the fine tradition of external work and the characteristics of times. "We should thoroughly implement the thought on diplomacy of socialism with Chinese characteristics for a new era, continuously facilitate a favorable external environment for realizing the Chinese Dream of national rejuvenation and promoting the building of a community with a shared future for humanity," said Xi. He pointed out that in order to have a correct assessment of international situation, an accurate understanding of history, the overall situation and China's role and position in the world pattern should be formed. Xi suggested to not only observe the current international situation, but also review the past, summarize historical laws, and look forward to the future to better understand the trend of history. As for the accurate understanding of overall situation, Xi underlined not only the observation of phenomena and details, but also a deep appreciation of the essence and overall situation, in order not to get lost in complex and changing international situation. He also asked to have a clear understanding of China's status and role in the evolving world pattern, and formulate principles and policies of China's external work in a scientific way, through cool-headed analysis of international phenomena and China's relation with the rest of the world. China has been in the best period of development since modern times, while the world is undergoing the most profound and unprecedented changes in a century, said Xi, adding that the two aspects are intertwined and interacted. He stressed that China enjoys many favorable external conditions to carry out work related to foreign affairs at present and in the years to come. Calling the period between the 19th and the 20th CPC National Congress "a historical juncture for realizing the two centenary goals of China," Xi said the period is of great significance in the historical progress of the great rejuvenation of the Chinese nation. Throughout the human history, the development of the world has always been the result of contradictions intertwining and interacting with each other, he continued. Xi then called for in-depth analysis of the law of how the international situation changes when the world comes into its transitional period, and the accurate grasp of the basic characteristics of the external environment China is facing at this historical juncture, in order to better plan and facilitate the country's work on foreign affairs. Xi stressed that the country's external work should be based on the overall plan of the CPC Central Committee, and should further improve its layout and highlight its priorities. The external work should focus on the key points in time of the Party and the country's work to break new grounds, as in the next five years, the country's first centenary goal is expected to be realized, and the process to realize the second is expected to begin, with a series of significant moments and events in the period, he said. The flag of a community with a shared future for humanity should be upheld to help make the global governance system fairer and more reasonable, and the construction of the Belt and Road should be solidified and deepened to elevate the country's opening up to a new level, Xi continued. He also highlighted furthering the country's foreign relations, including those with major powers, neighboring countries and developing countries. Xi noted that diplomacy represents the will of the state, and the diplomatic power must stay with the CPC Central Committee, while the external work is a systematic project. He thus asked political parties, the government, the people's congresses, the Chinese People's Political Consultative Conference, the military, local authorities and the public to improve their coordination and make their own contributions, so as to form a new situation of the external work under the overall leadership of the Party that coordinates all sides, and ensure that the foreign policies and strategies of the CPC Central Committee are implemented. Stressing that cadres are the decisive factor after setting the political course, Xi called for a strong contingent of foreign affairs personnel that are loyal to the CPC, the country and the people and are politically solid, professionally competent and strongly disciplined in their conduct. He called on foreign affairs cadres to enhance ideal and belief education so as to upgrade their competency and overall quality, and he also called for improving the living conditions of personnel stationed abroad so as to iron out their concerns and worries. 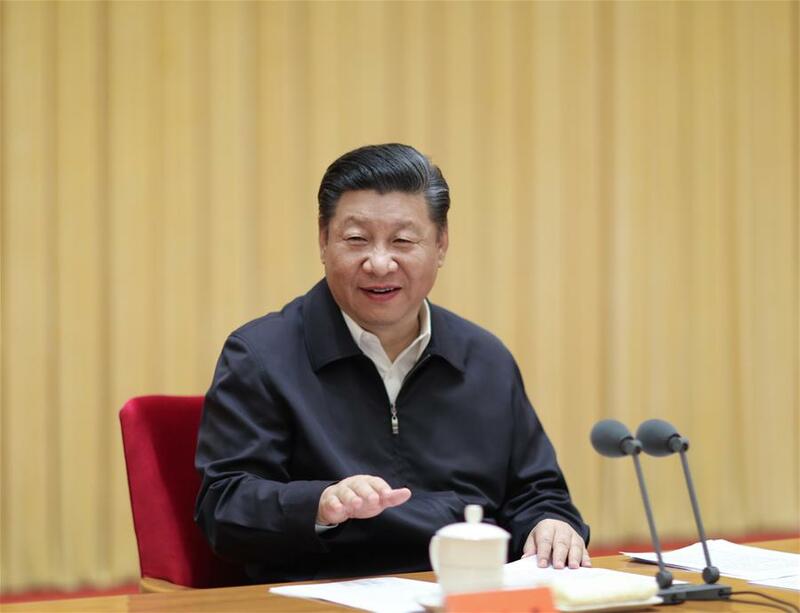 Xi stressed that the reform on the institutions and mechanisms concerning foreign affairs is the internal demand of advancing modernization in the state governance system and governance capabilities. He called for implementing the reform on the institutions and mechanisms concerning foreign affairs under the decision of the central Party leadership and enhancing the party-building in institutions abroad so as to form a management mechanism catering to the requirements of the new era. When presiding over the conference, Li Keqiang said General Secretary Xi Jinping's important address comprehensively summed up the historic achievements China has scored on foreign affairs since the 18th CPC National Congress and kept a firm hold on the development trend of China and the world from the overall situation of the cause of the Party and the country. Li said Xi's address indicated the clear direction for the work on foreign affairs in the new era and provided fundamental guidance. He called for a thorough understanding and full implementation of the address and Xi Jinping thought on diplomacy of socialism with Chinese characteristics for a new era in order to promote the work on foreign affairs on all fronts. While delivering concluding remarks at the conference, Yang Jiechi, member of the Political Bureau of the CPC Central Committee and director of the Office of the Foreign Affairs Commission of the CPC Central Committee, said that the most important outcome of this conference is that it established the guiding position of Xi Jinping thought on diplomacy. Xi Jinping thought on diplomacy is an important part of Xi Jinping Thought on Socialism with Chinese Characteristics for a New Era, said Yang. It is a major theoretical achievement in the thoughts on state governance in the area of diplomacy by the CPC Central Committee with Comrade Xi Jinping at the core, and a fundamental guideline for China's external work in the new era, Yang said. "We should integrate our thoughts and actions into General Secretary Xi Jinping's important address and Xi Jinping thought on diplomacy, and make new advances in China's external work," he said.